Ada pertanyaan untuk Rama Shinta Hotel Candidasa? Jika apa yang Anda cari adalah hotel yang terletak strategis di Bali, carilah Rama Shinta Hotel Candidasa. Dengan lokasinya yang hanya 1 Km dari pusat kota dan 65 Km dari bandara, hotel bintang 3 ini menarik perhatian banyak wisatawan setiap tahun. Yang tidak ketinggalan adalah akses mudah dari hotel ini ke sejumlah obyek wisata dan landmark kota ini seperti Pantai Anom, Geko Dive, Water Worx Dive Center. Fasilitas dan pelayanan yang ditawarkan oleh Rama Shinta Hotel Candidasa menjaminkan pengalaman menginap yang menyenangkan bagi para tamu. Untuk kenyamanan para tamu, hotel ini menawarkan WiFi gratis di semua kamar, layanan kebersihan harian, resepsionis 24 jam, Wi-fi di tempat umum, parkir valet. Nikmati fasilitas kamar berkualitas tinggi selama Anda menginap di sini. Beberapa kamar memiliki akses internet WiFi (gratis), kamar bebas asap rokok, AC, layanan bangun pagi, meja tulis, yang disediakan untuk membantu Anda mengumpulkan tenaga kembali setelah lelah beraktivitas. Daftar lengkap fasilitas rekreasi tersedia di hotel termasuk kolam renang luar ruangan, pijat, taman, olahraga air (tak-bermesin). Rama Shinta Hotel Candidasa adalah tempat menginap ideal bagi para wisatawan yang mencari pesona dan kenyamanan dari Bali. Sy hanya menginap semalaman dari rencana dua malam, karena kamarnya kurang nyaman. Pergilah ke Candidasa jika Anda ingin ketenangan. Jangan bayangkan Kuta atau Legian, suasana di sini benar-benar sangat berbeda! Hotel yang saya tinggali cukup nyaman, dengan kolam renang yang tidak begitu besar, namun cukup untuk menghabiskan waktu.Tidak ada TV di kamar, namun sisanya cukup nyaman, tempat tidur yang nyaman dan kamar mandi yang cukup bagus, menurut saya. Di sekitar hotel memang banyak tempat makan yang lebih berupa cafe. Namun jika anda malas keluar dari hotel, bisa memesan makanan dari restoran hotel saja. Menurut saya, untuk ukuran makanan hotel, cukup enak dan harganya tidak mencekik leher. Cobalah arak bali jika anda suka minuman ber-alkohol yang cukup pahit. Itu unik menurut saya! Yang agak disayangkan dari hotel ini adalah tidak adanya akses ke pantai yang bagus dari sini. Jika anda keluar melalui pintu samping dan berjalan sedikit, anda memang bisa menemukan pantai, namun sangat kecil dan tidak bagus. Kata orang-orang di sana itu dikarenakan pihak hotel di Candidasa cenderung membangun hotel terlalu menjorok ke pantai. Tempat yang dekat dengan kolam Candidasa. meskipun tidak langsung berada di pinggir pantai. Tetapi kolam renang yang ada cukup bersih dan situasi hotel nyaman dan tenang. Kamar mandinya cukup besar dan bisa melihat-lihat awan. Kamar tidur cukup besar. sayangnya masuk dari jalan besar ke Hotel harus melewati jalan yang sempit cuman dapat dilewati 1 mobil. tapi halaman hotel cukup besar. Well what a fantastic place to stay. We stayed next door two years ago and noticed this great looking hotel. So we decided to stay here with 6 of our close friends, including her 84 yr old father, for my partners Karen’s 50th birthday. The gardens and pool area were so beautiful and so well kept. The hotel food was so good along with the service from the friendly helpful staff. The manager Eka was so helpful, we were having breakfast one morning when there was some maintenance work being carried out in the kitchen. She immediately asked the workers to stop the work till after we had finished breakfast. Many many thanks Eka, we had a fabulous stay and we will be back again. Will and Karen. This was my second stay at Rama Shinta. Its a beautifdul cozy hotel with fabulous kitchen staff. Drinks IN the pool? Not a worry...... want deep fried mars bars? Go grab one up the shop and they will make it for you. The rooms are nothing fancy but are certainly clean. Will be back. 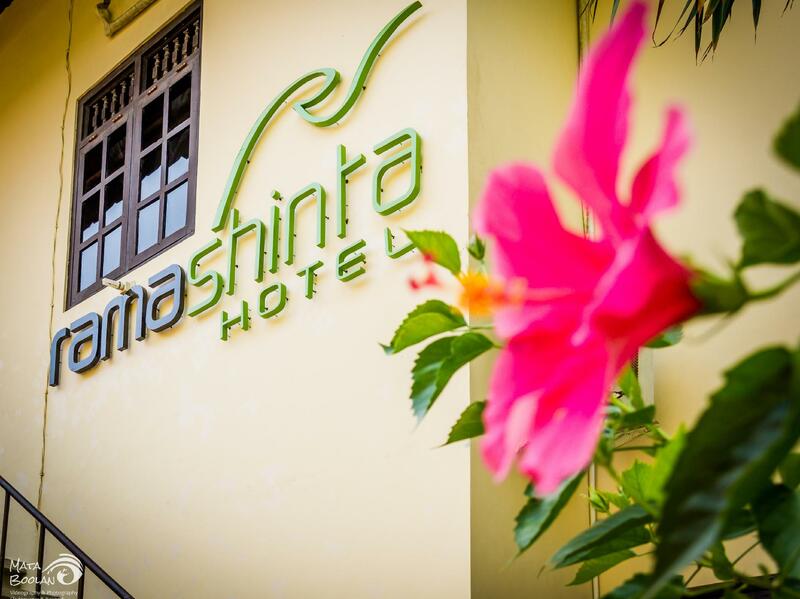 this hotel is located in central of candidasa. you can go any famous restaurants within walking distance. there are vincents or joglo or the others near the hotel. If you like parties, you can choose another area. candidasa is really calm and quiet. the people who you can meet on the street and restaurants are so polite and kind. We stayed 1 night in this hotel which is good value for money. 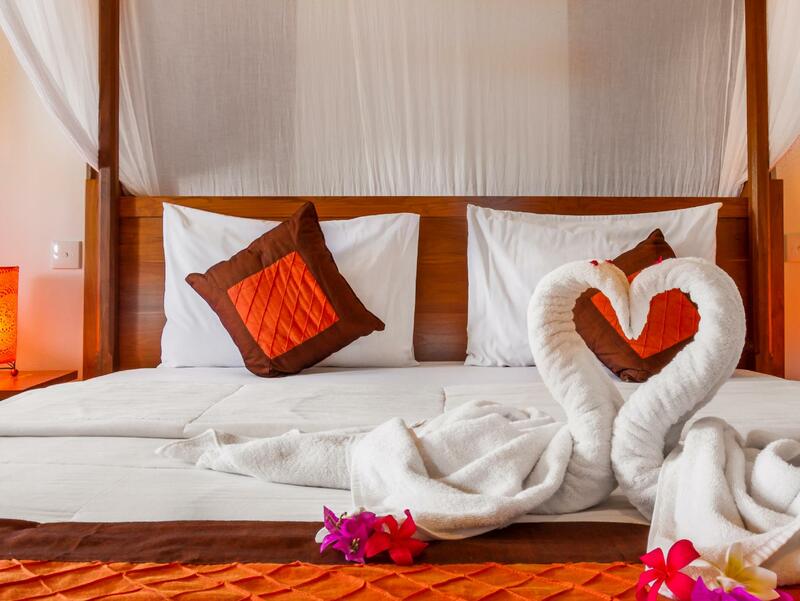 The rooms are more authentic Balinese style and I especially loved the big half open bathroom ! It's also centrally located just at the only lake in Candidase, easy to access by foot the restaurants and shops on the main street. I will definitely stay there again for 1 or 2 nights. Have stayed here before. A lovely little hotel with a very nice pool. Last time it was very quite this rime there was a family from Perth with 3 children and their friends with another 3 who were very noisy in the pool and there was nowhere to escape them. Eventually they closed the pool and made them move on.Next day no problem. When we arrived we were shown all available rooms and we could chose the one we liked best. We took the room above the reception which was only recently refurbished and had a completely new bathroom. Everything was very clean. The room is decorated in an appealing composition of Indosian and western elements with safe, fridge and AC. The bed also features moscito nets. The garden of the hotel is very beautiful and is carefully maintained with a lot of colorful flowers. Service was generally very good and friendly. However, we had to leave early on the last day and asked for an early breakfast. For some reason this information was not passed on to the restaurant which was quite suprised by our early appearance. The restaurant was able to deal with our unexpected request anyhow and provided the breakfast without any trouble. Candi dasa is a very calm little village on the coast. It does not have a lot of sand beach, so take a ride to blue lagoon for example into consideration if you want to go the beach. The surrounding of the hotel looks authentic and a short walk to the hill brings you into an authentic village. However, the people there seem to be relatively poor which is no problem, just dont be surprised. Overall a stay in this hotel can be reommended but dont expect exciting action in Candi dasa. The staff friendliness and willing to please. Comfortable bed. Good fresh food. We enjoyed our stay very much. Candidasa is an easy going village with some great restaurants. You don't get the hawkers and hasselers like the bigger places. You do get asked by taxi drivers and the occasional sunglasses seller. They are all very polite and take no for an answer. They are only trying to make a living after all. Make sure you check out the fishing and snorkeling guides at the beach - if you don't spot them, they will definitely spot you! Jon, Slippy, Alex, Made and the team will make you a good deal after a bit of negotiating. The pool and the gardens are beautifully maintained. The staff were an absolute delight. Something that did trouble us was the abruptness of the man who owns the Hotel. He was most unfriendly and we witnessed him being rather mean to the staff in the restaurant. We were there for a week and never once did he even say hello. Just the small things sometimes make a huge difference. We did not like our stay in this hotel. 1) The doors on all rooms do not have proper door locks but use old fashioned padlocks. The pin in our door could just be pulled out. We asked for it to be fixed but our door remained unlocked all day until we returned and asked for it to be fixed again. 2) The bathrooms are NOT air conditioned and open to the external environment. There is a large vent in the door between bedroom and bathroom so it is difficult to get main bedroom cool enough as all cold air escapes through the bathroom. No A/C even though it is advertised as having A/C. 3) Renovations were being done past 9pm at night. 4) Lots of mosquitoes as hotel is located right next to a large lagoon. Because bathroom is open to environment you get bitten every time you use the bathroom. 5) Hotel tries to make money where ever it can. owners live in the best room and keep a watch full eye on their staff. It felt as though the staff were scared of the owners and if owners were close by they would alter the answers to suit what the owners expected them to say. We booked four nights at this hotel but after the first night we were unhappy and decided to leave the hotel after the second night. We asked for a refund from the hotel which was refused. We then applied for a refund through Agoda. They agreed to refund one of the nights but not both. The best thing about this hotel is the staff. They are friendly and very professional. Most of the staff are very young - just out of high school - but their English is very good. For low season the prices (around 36 euro/night with breakfast) are far too high, because Candidasa is like a cementery in march! Free shuttle service to a (white sanded) beach (6km away) would have been nice. The room was clean. Food was only ok-ish, too much garlic everywhere - just my opinion. But: There are enough Bars on the street. Went to Vincent's many times! Very nice staff though. Big Minus: Laundry service was a joke. Shirts must have been in water for 2 seconds. Beside the unpleasant soap/perfume smell the sweat was still strong. They definetely need a washing maschine!!! We had a good stay here, the place is like a small oasis with flowers and green everywhere. The pool is very beauiful and just outside the hotel premises is the famous pond which you ofcourse should take a walk around. Candidsa is a small place with not so many things to do if I should be honest. So be prepared to just stay in the hotel area and read a book and relax or go and do some activites. We went out with the local boatsmen (100 meter down from the hotel they stay at the beach) and did some snorkeling and then went to white sand beach. Its a half day jaunt and much recommended.